Posted on: November 14th, 2018	by Melanie C.
There’s something about visiting a city at Christmas time. The people shopping and rushing, the cold air making cheeks rosy and the sounds of the season (traffic noises? I’d rather say Christmas carols!) 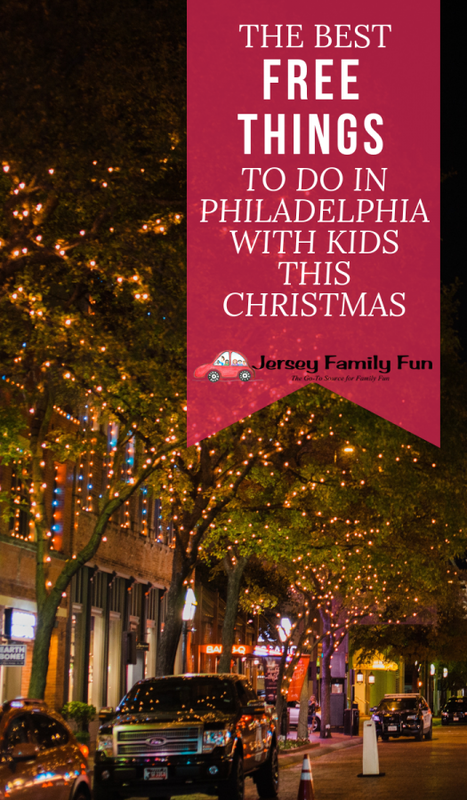 We’ve been sharing tips for visiting Philadelphia at Christmas time for years and we now share with you what’s happening in Philadelphia for Christmas 2018. 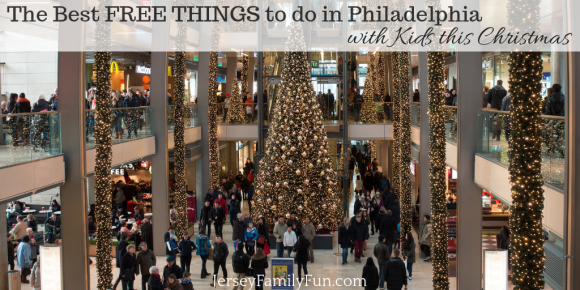 Even better, these are all FREE Christmas events in Philadelphia! The Macy’s Christmas light show is a tradition reaching back to 1956 and includes performances on the historic Wanamaker Grand Organ. This year the show is narrated by Julie Andrews and includes 100,000 LED lights. Watch snowflakes, ballerinas, and reindeer float beyond the four-story-high velvet curtain of the Grand Court atrium. 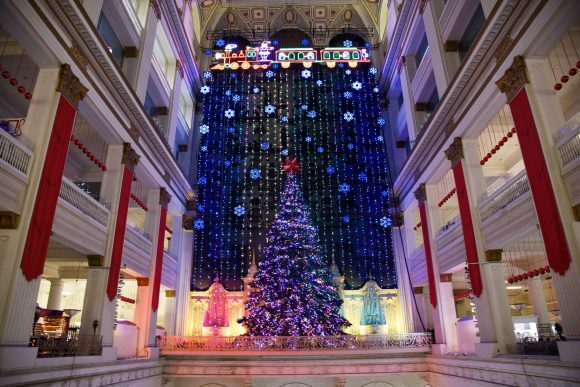 Macy’s Christmas Light Show & other holiday displays are located at The Wanamaker Building, 1300 Market Street Philadelphia, PA.
Join Macy’s for a special Light Show and Window unveiling event with Santa on November 17 at 12:30 PM. 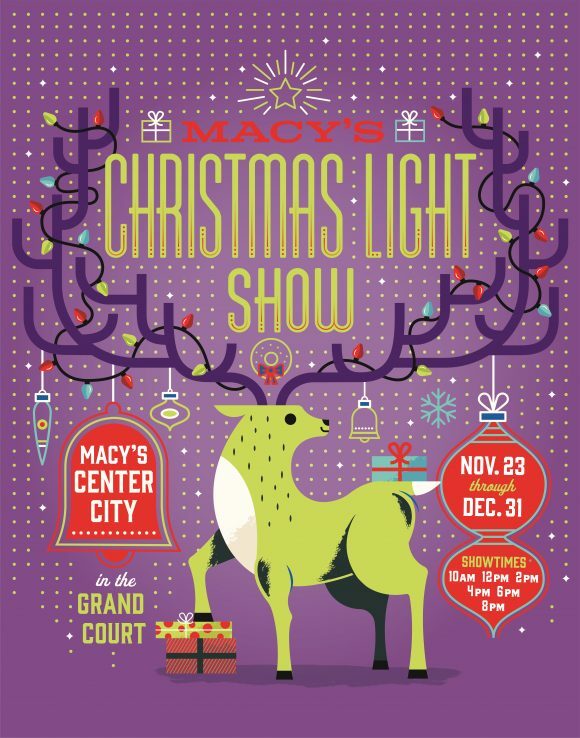 Macy’s Christmas Light Show will run November 23-December 31, 2018. The light show repeats 2 hours from 10 AM – 8 PM. For more information about the details and history of the Macy’s Christmas Light Show visit this link. While you’re at Macy’s don’t miss their holiday window displays and the third floor Dickens Village with vintage animatronics. The Macy’s Dickens Village entrance starts out with a giant book and a tree where you can take pictures while you wait in line. You can walk through the village at your own pace but allow yourself at least 90 minutes to enjoy it. 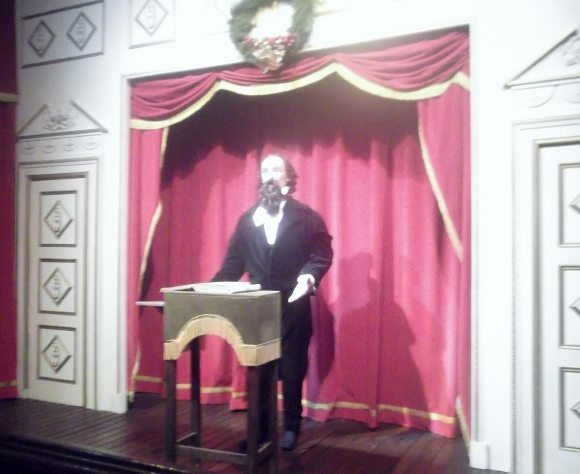 Once the workers instruct you to come in (they are all dressed in appropriate time period garb with accents to boot) a little Charles Dicken’s himself begins to tell the story of Mr. Scrooge. In the beginning you walk through a tiny village which you can walk up to each door, seeing moveable scenes in each doorway and signs that read parts of the story. Continue your journey through Christmas Past, Christmas Present, Christmas yet to Come and The Fate of Scrooge. At the end of the story you have a choice to go right and leave or go left and sit on Santa’s lap. The start of your journey through another time. The best viewing times are Mondays through Thursdays. Go early and do not come after the light show like we did years ago, everyone had the same idea. Go to the bathroom before entering which is directly to the right of the entrance. Dress in layers as it does get warm waiting in line to go through the Macy’s Dicken’s Village. Bring activities and snacks to keep kids busy as they wait in line. The Dickens Village contains realistic scenes with statues representing the characters and ghosts from The Christmas Carol. These images might be scary for some children. Christmas to Come includes Death himself and darkness/strobe lights. Christmas Past includes three ghosts hanging that may be scary for some children as well. Children can get their pictures with Santa or other background settings in the Dickens Village area. Santa returns to the North Pole December 24, of course! 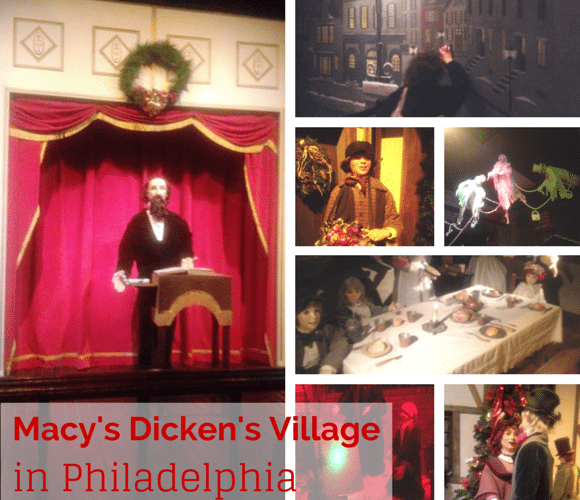 You can see all of our Macy’s Dickens Village photos in our Facebook album. From November 15 until December 31st you can see Franklin Square’s own Electrical Spectacle. The Electrical Spectacle is more than 50,000 LED lights, featuring a 12-foot-tall lighted kite and lights throughout the park, that form an amazing light show. Start a new holiday tradition this year with this Franklin Square holiday light show! Inspired by Benjamin Franklin’s electrifying genius, the free Electrical Spectacle Holiday Light Show presented by PECO is the key to holiday fun in Franklin Square. Marvel at more than 75,000 lights as they shimmer, dance, and illuminate the Square to a soundtrack of holiday classics, some of which are performed by The Philly POPS®* in two alternating shows every 30 minutes beginning at 4:30 daily. Every evening, one lucky audience member will be selected to “ignite” the 4:30 pm show. 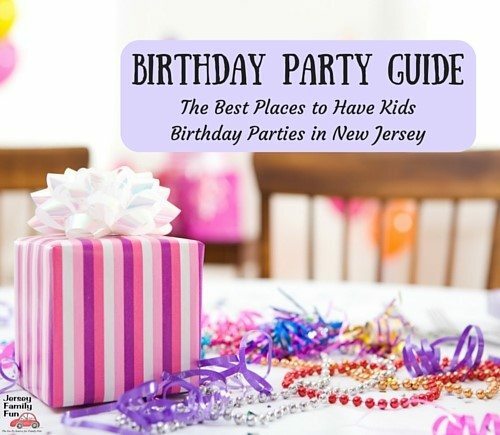 Other festivities include visits from Santa and Ben Franklin, rides on the holiday train and carousel, a beer garden and fire pits and even mini-golf with warming stations. Franklin Square is at 200 North 6th Street, Philadelphia. Weekly events include Santa, Nutcracker characters, Kwanzaa and Hanukkah celebrations and a Frozen night. Come back after Christmas for the New Year’s Eve countdown. In the lobby of the Comcast Center is one of the world’s largest high resolution displays and during the holiday season it is a destination for many! Since 2008, the Comcast Center has been delivering free holiday fun! 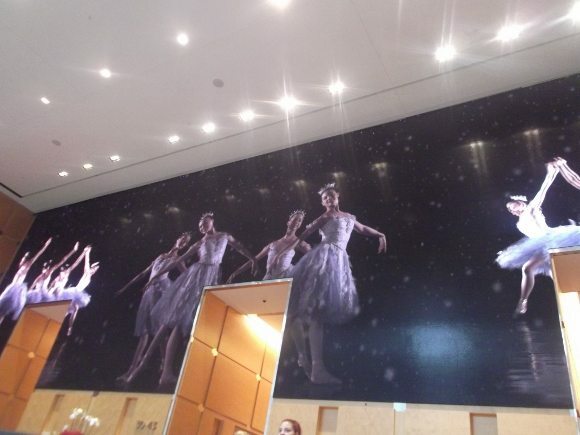 Over 1 million people have come and seen the show on the giant 83’ x 25’ Comcast Experience video wall in the Comcast Center lobby, which is one of world’s largest highest resolution LED displays. Now in its 10th year, the 15 minute show is set to the music of a like Carol of the Bells, Jingle Bell Rock, and The Twelve Days of Christmas and also scenes of perfomances by the renowned Pennsylvania Ballet. Also find a life-size Snow Globe from The Grinch, presented by Xfinity and Illumination; visits with Santa; local choir performances; seasonal confections at Vernick Coffee Bar at the Comcast Center this season. The Comcast Center is located at 1701 John F Kennedy Blvd. Philadelphia. The Comcast Holiday Spectacular debuts November 22 and runs through January 1. The show begins at the top of the hour daily from 10 AM – 8 PM (not at 5 PM on weekdays). View our Facebook album from previous year’s shows to see pictures from the Comcast Holiday Spectacular. 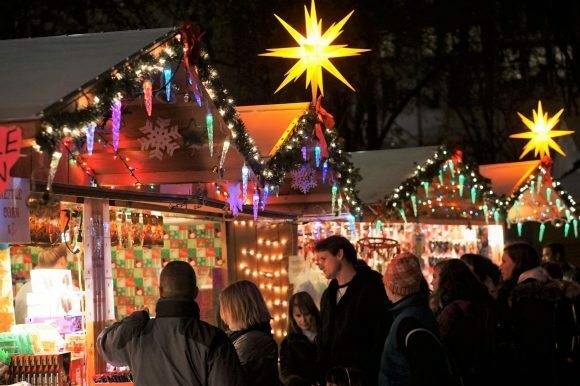 Christmas Village returns to LOVE park in 2018 for its 10th anniversary with Now in its tenth year, a Christmas season must visit is the Philadelphia Christmas attraction known as Christmas Village – relocated to LOVE Park! This year, see the return of the traditional German market, Christmas decorations live music and more. See Santa, enjoy children’s activities and shop and eat at 80 different vendors. Admission is free, with food, drink and shopping pay as you go. 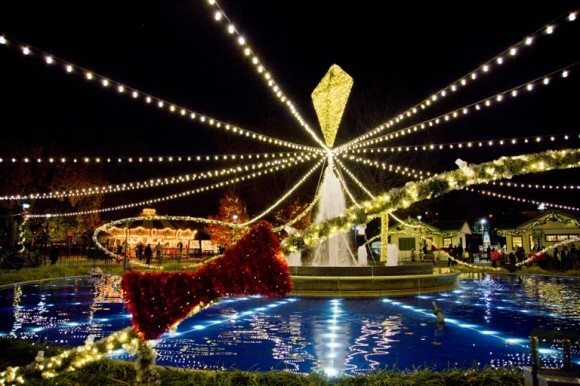 On top of the great shopping and dining experiences, Philadelphia’s Christmas Village visitors will enjoy the glorious Christmas Tree in Dilwort Park, a Wish Wall in conjunction with the Make-a-Wish Foundation, a kid’s zone on the weekends, theme days and weekends, tasting tours with Chaddsford Winery, live music during evenings and weekends, and other surprises! Dogs welcome too! Christmas Village is located at 1501 John F Kennedy Blvd, Philadelphia. Preview weekend is November 17/18 and the official opening is November 24. Each of the 5 weekends is specially themed with performances throughout the day. Christmas Village is open daily 11-7 and 11-8 Friday and Saturday. Holiday hours vary. Visit www.philachristmas.com for more information. The Penn’s Landing’s Blue Cross RiverRink Winterfest will host its 25th season in 2018. Winterfest is a pop-up winter garden with cozy fire pits, fresh-air eats and drinks, a kids lodge and arcade, and ice skating. Plus, special events and activities are on tap at the Blue Cross RiverRink throughout the season. It’s open from November 23 -March 3, hours vary. Skating and warming cabins are at an additional cost. 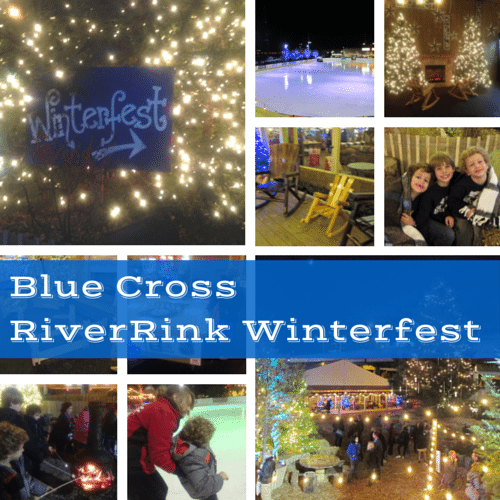 Read more about our experience here in our 13 Winterful Activities to do With Your Kids at Blue Cross RiverRink Winterfest. 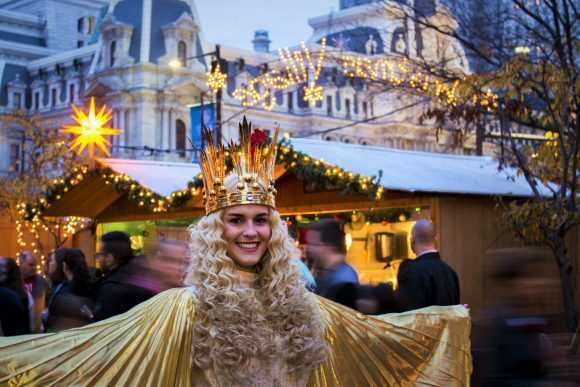 Wondering how you’ll get around to all these great Philadelphia Christmas events? The Snowflake Shuttle powered by PHLASH makes it easy to enjoy all the holiday events with free rides throughout Historic Philadelphia, beginning at Franklin Square, Thursday through Sunday evenings, 6 – 9 pm, beginning November 23.